Another popular method or way of backing up your Dolphin 7 database is to use phpMyAdmin. Which, is available in most hosting control panels. It can seem a little overwhelming if you have never used it, but it really doesn't take too long to get the hang of it. 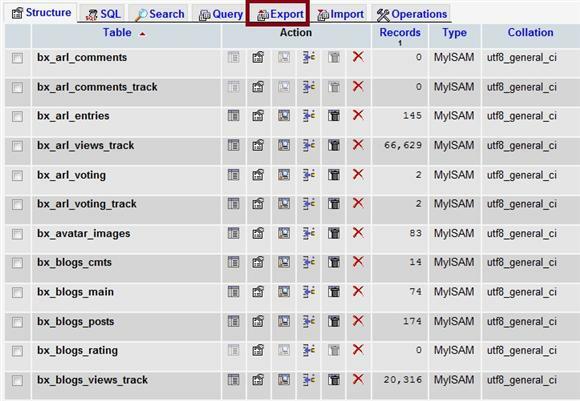 PhpMyAdmin is a very powerful tool that can really help you backup, restore, and administer your database. It is not Dolphin specific so it can be used to administer any mysql database. 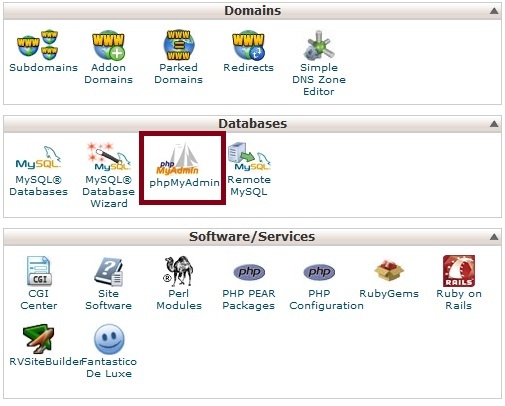 I frequently use cpanel control panel, but many other hosting control panels also have phpMyAdmin available. Just find and locate it in your particular control panel. 1. Locate and find phpMyAdmin in your hosting control panel. Double click on phpMyAdmin to start or load it up. 2. Once phpMyAdmin loads up find your database in the column on the left, and click it. 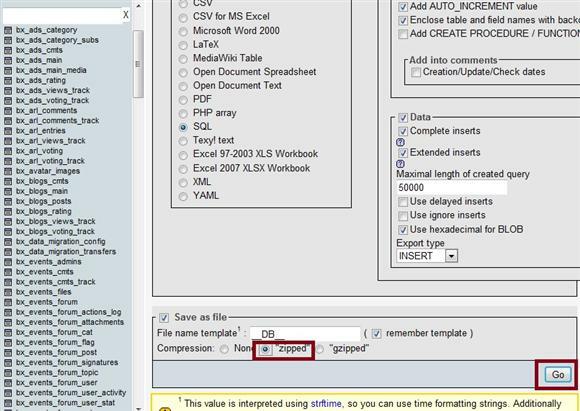 In this example the database is test_database for demonstration purposes of this tutorial. You will need to know the name of your database. 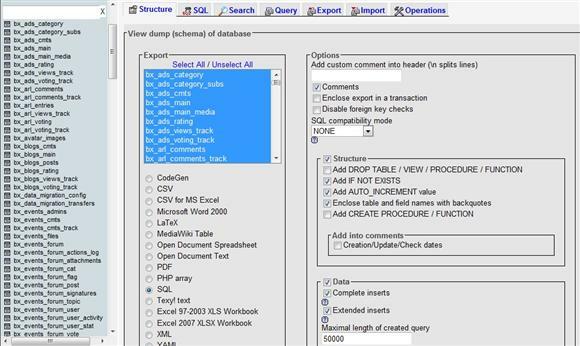 If you only have 1 database it should be simple enough to figure out. If you have more than one, make sure you select the right database. 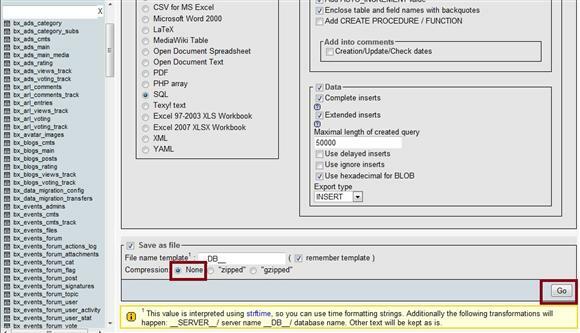 If you are unsure what your database name is you can find this by opening the file /inc/header.inc.php (http://www.yoursite.com/inc/header.inc.php) with your hosting file manager/editor or a ftp client. The 'db' line will be the name of your dolphin database. 3. Now you will see all the Dolphin 7 database tables for your site. Find the "Export" link near the top and click it. 4. This screen should be filled out for you. Make sure you do not deselect any of it. 5. Scroll down the page and you will be able to choose the file format you wish to export to. 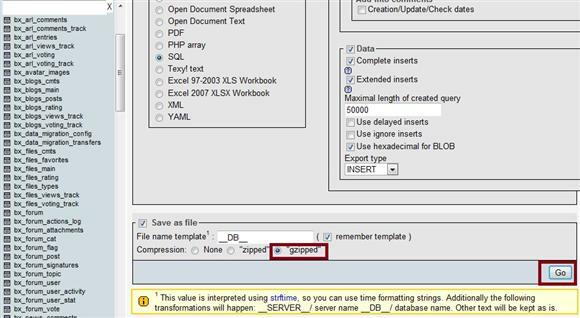 Select "None" and click the "Go" button for uncompressed .sql format. Save to somewhere on your local pc such as your desktop. If you have a large database "None" uncompressed could take awhile to download. 6. To download it in .zip format change compression to "zipped" and click the "Go" button. Save to your local pc like your desktop again. 7. To download it in gzipped format change the compression to "gzipped" and click the "Go" button. Save to your local pc desktop again. Once you have your Dolphin 7 database download to your local pc, you might make a new folder called database backups, sitename-backups, etc. Then, make another folder inside with the date and put the backup or backups in there. Also consider adding a notepad or wordpad text document with a brief explanation of what, when, and a brief description of what the backup contains. Should you need to restore the database many linux hosting setups will not read the .zip format backup. It will tell you unknown or wrong format. Because of this you should download them all if possible. Otherwise, the gzipped compressed format (smaller download), or the uncompressed format (larger download). The .zip format is handy because it will be compressed and smaller like the gzipped format, and it can be opened and extracted easy with windows based pc's. You can open and extract a gzipped format with something like winrar or 7zip.